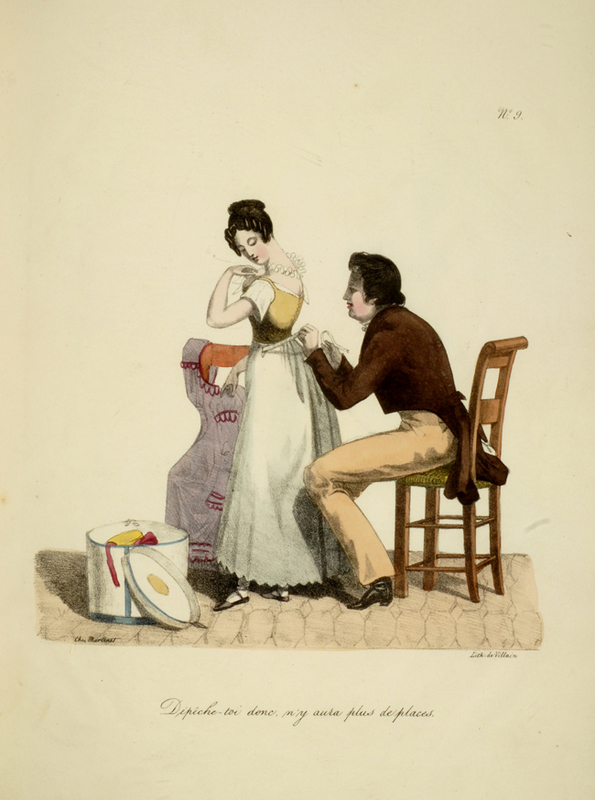 The day of the laundress - signed J.S. ("I need need a little starch in my shorts"). 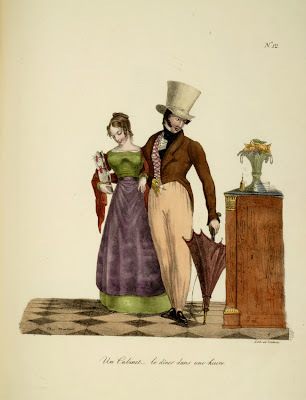 The contemporary manners, customs, and costumes of Parisian society in typical scenes, illustrated in twenty-one hand-colored lithographs with great charm and wry, understated humor by Swiss genre painter and lithographer Jean Gabriel Scheffer (1797-1876) and [Edme] J[ean]. Pigal (1798 - 1873), are featured in Recueil des Scènes Familiéres, et de Société de Paris, a scarce, three-volume suite of color plates published in Paris, 1824. 8 AM - signed J.S. A beautiful fresh Gamin! - signed J.S. 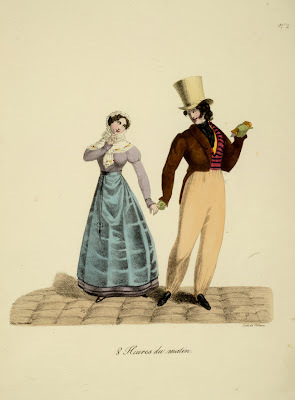 ("The Georges Sand look - enchanteur, ma chére!). Scheffer studied with Jean-Baptiste Regnault and was a friend of Corot, Théodore Carurelle d'Aligny, and Louis-Léopold Robert. His work was shown at the Salon de Paris beginning in 1822; his reputation as a designer of many wryly humorous lithographs, typically signed "J.S.," was firm. (See Benezit Vol. 9, p. 354). 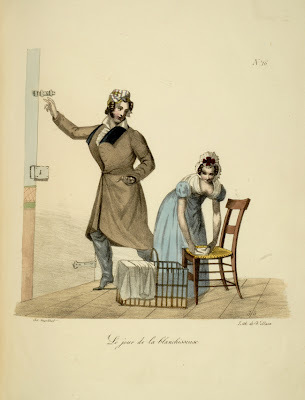 A Cabinet - dinner in an hour - signed J.S. ("And you, ma chére, are on the menu"). 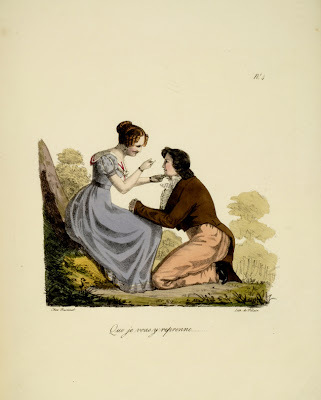 Closely associated with printer-publisher Chez Martinet and lithographer Villain, Scheffer also created Scènes de jeunes gens (1825), Ce qu'on dit et ce qu'on pense (1829), and Petits travers (1830) with them. How the devil does she knows it all? - signed J.S. ("She senses my desire; I fear the jig is up!"). (The night is young. I still have a shot."). 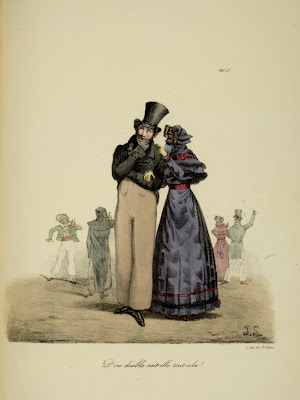 "From the late 1820's to the late 1830's, [J. Pigal] produced numerous lithographs caricaturing contemporary customs and social types, in which he ridiculed the hypocrisy of the bourgeoisie and the vulgarity of the lower classes. 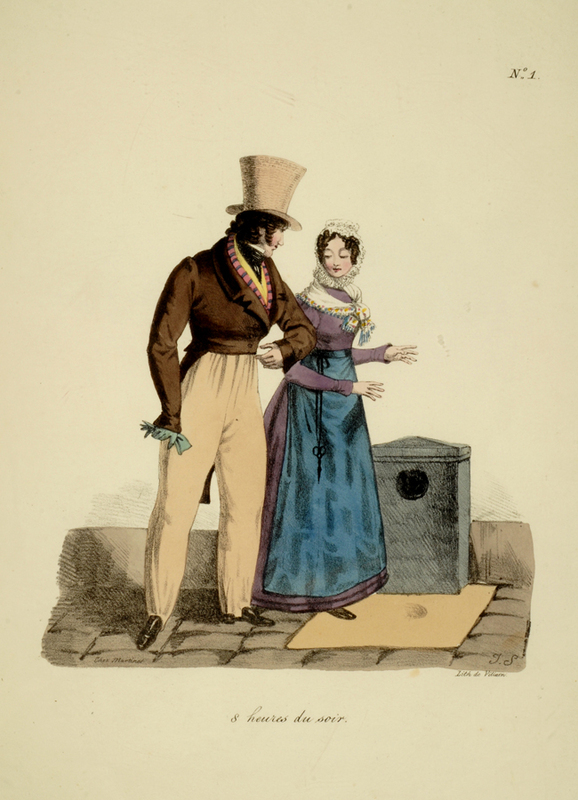 His favorite characters were the street urchins of Paris, servants, coachmen and doormen, and lecherous old men" (Beatrice Farwell, The Charged Image: French Lithographic Caricature, 1816-1848. Santa Barbara Museum of Art, Santa Barbara, 1989, p. 127). ("But true wisdom is in the flesh!"). I'll take you back again - signed J.S. ("Whew, that was a close one!"). 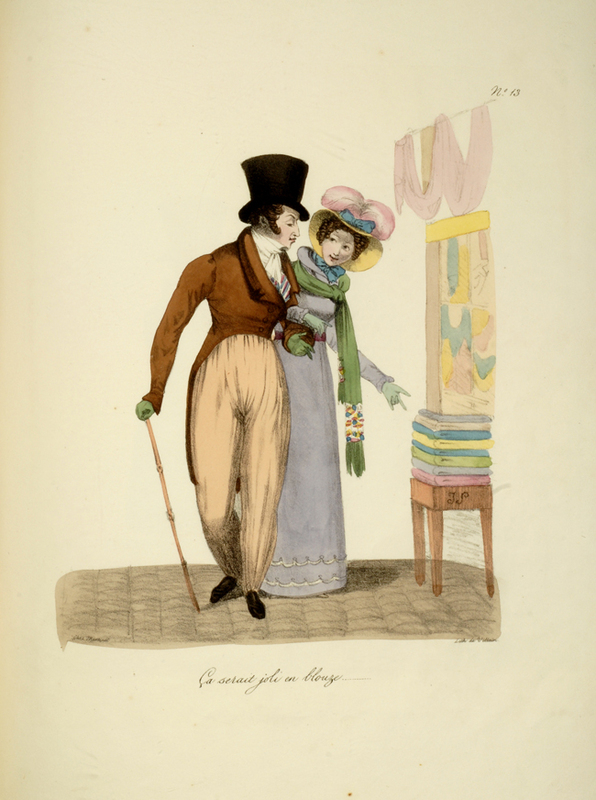 "A major French nineteenth century artist and caricaturist, Edme Jean Pigal [1798-1873] studied art in Paris in the studio of Baron Gros. He first exhibited his paintings at the Paris Salon in 1827 and continued to annually exhibit his art there for more than thirty years. Pigal's early art was mainly in the medium of lithography. After 1838 he turned more towards painting, particularly religious and historical scenes commissioned by the French government. His last years were spent as a professor of art at the Lycee in Sens" (Art of the Print). ("Uh, chére, we're not going anywhere, and this is coming off, not going on"). Should he answer... signed J.S. 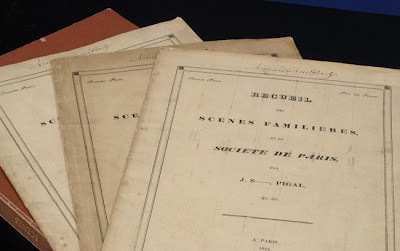 Only one copy of Recueil des Scènes Familiéres, et de Société de Paris is found in libraries worldwide, at Yale. 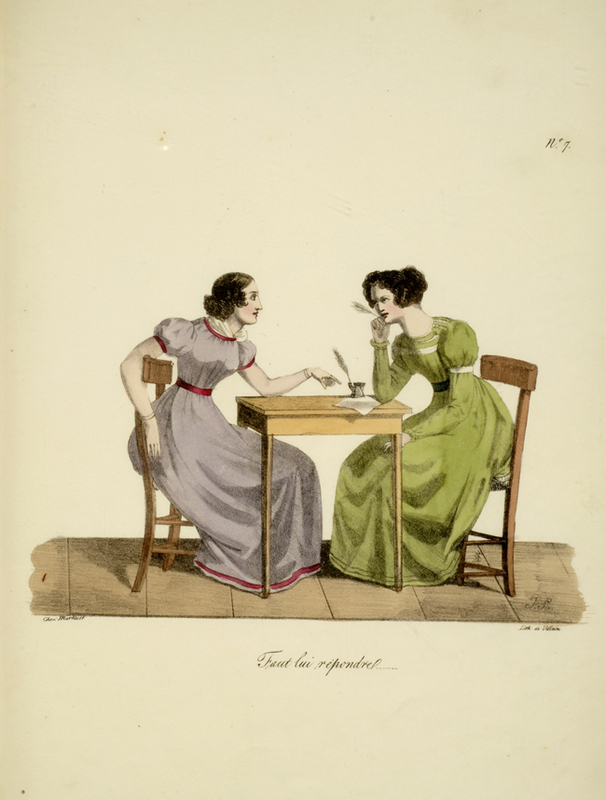 No copies have come to auction within the last thirty-five years. Suspect me, me!! - Signed J.S. 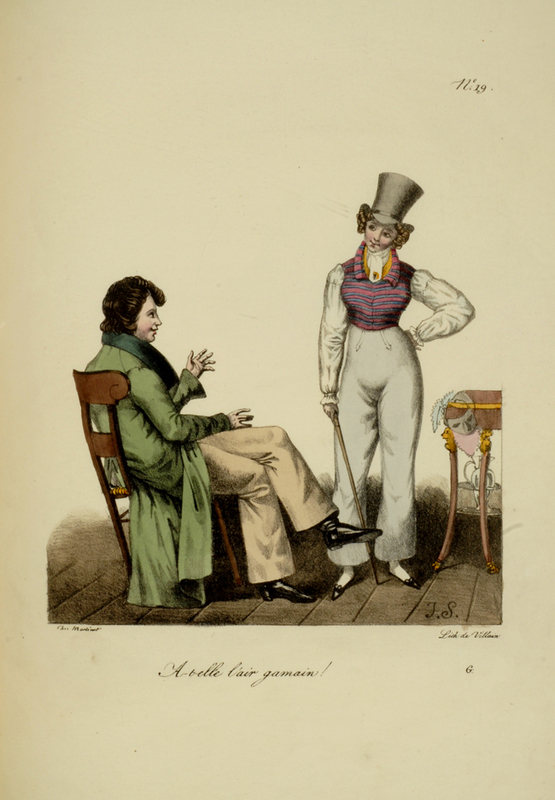 ("Yes, I suspect you're a fat bore"). 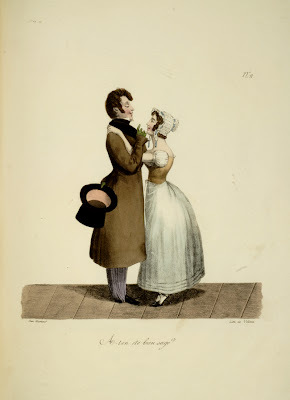 Last moments of a young lady - signed J.S. ("Buck up, amie. Be thankful the old sod is saving your reputation"). First (only) issue, complete in three parts. 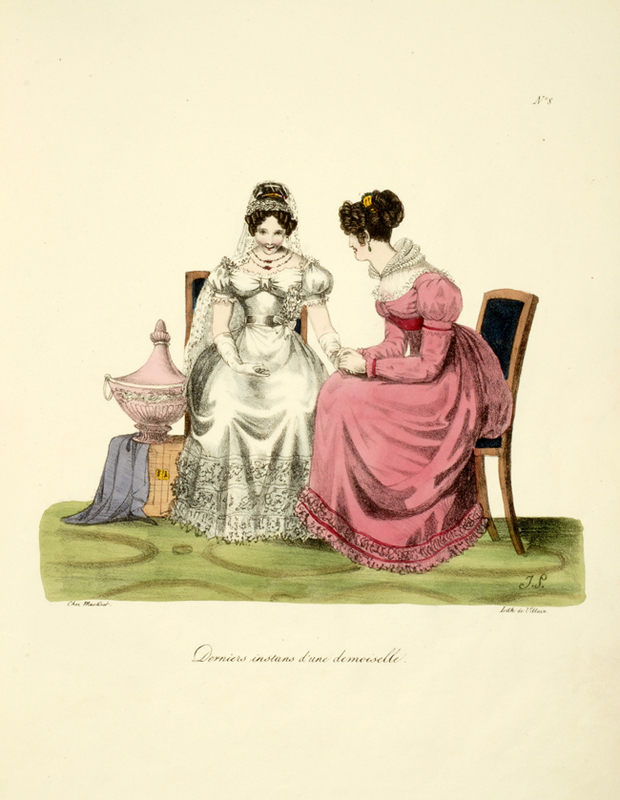 Three folio volumes containing a total of twenty-one hand-colored lithographed plates signed: Chez Martinet, Lith. 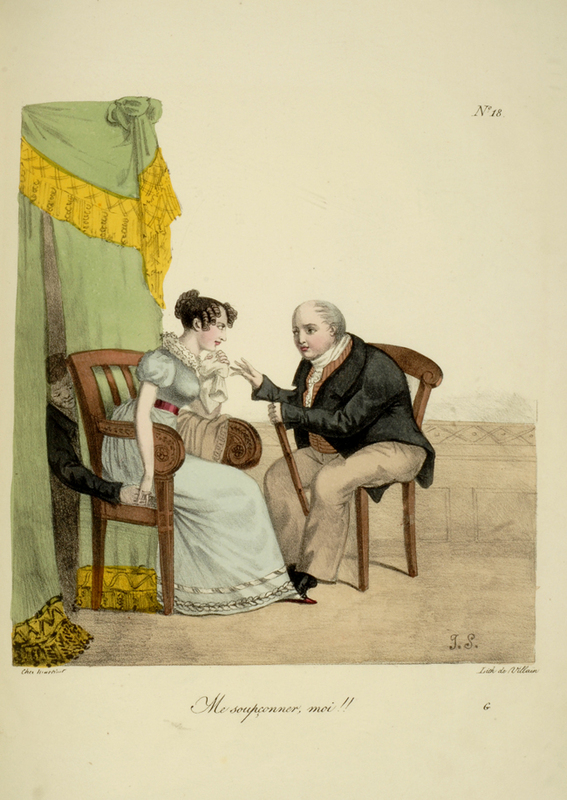 de Villain; numbered and captioned, with original tissue guards, and watermarked "J Whatman 1823." Original printed wrappers. All edges gilt. Not in Colas, Lipperheide, or Hiler.